In 2019, who is Logan Peat? I’m a mountain biking athlete with a fishing problem. I grew up in Owen Sound, Ontario. In 2007 fresh out of high school, I made the move out West to attend Lakeland College and to further my mountain bike career. I was one of those kids ripping bikes around the neighborhood, building jumps out of what ever I could find. That passion for biking and adventure never stopped and eventually progressed into a Professional Mountain Biking career. I am best known for competing in the Slopestyle discipline and have travel the world doing it. I qualified for the highest level of competition and was in the top five for years and have been fortunate enough to stand on the podium. Creating videos was also a big part of my biking career. I love filming and releasing videos and enjoy all the positive feedback from the bike community. I grew up fishing with my family before I could walk. My dad is a huge multi-species fisherman and got out on the water nearly every weekend. It didn’t matter the time of the year we enjoy fishing in all seasons. We chase bass all summer, trout and salmon in the spring and fall and ice fish during the winter for both walleye and perch. I love all types fishing but hunting bass and pike in shallow weedy lakes is one of was my favourite. I will never forget some of top water strikes and big catches from my youth. I am so thankful my family took me fishing at a young age it sparked a passion that will last a lifetime. What push you into swimbaiting? The search for bigger fish is what got me into swimbaiting . I have done a lot of research online about the giant lures and their success for catching huge game fish. When I tried big swimbating, I got results right away and I have never looked back. It is a technique I will always want to use when for hunting big fish. Fishing with my dad has been one of my biggest influences for my passion for fishing. I am also a Bassmaster and FLW tournament fan. I like the old school pros like Rick Clunn and Steve Kennedy. On the Swimbait side of things, my influence came this past winter in California. One of my biking friends introduced me to Luke Brennan, a fisherman and bait maker. He was nice enough to invite me out on his boat for a day of fishing. As soon a we left the dock, Luke picked up his big 10”glide. On his first cast, he had 3 or 4 followers come right up to the boat. I couldn’t believe the drawing power of the big bait. Luke sold me a Deps 250 and I landed my personal best bass within a couple weeks. I was hooked! Thanks, Luke!! The Pike trip was truly insane. By far the best and scariest freshwater fishing I have ever experienced. Not a place I’m willing to dangle my feet in the water or even bother rinsing my hands between fish. I knew the potential of big fish when I arrived and couldn’t wait to throw my big baits. The first day out it was instantly on with the DRT Klash 9, out fishing my Dad’s conventional gear. It wasn’t long until he dug out an S-Waver and got to work. Over the 5 days of fishing we landed 70 Pike over 40” and the biggest was 46”at 27 pounds. Fishing that glide super slow in high potential areas was key. I was amazed how many fish we could catch out of small areas, when fish methodically. 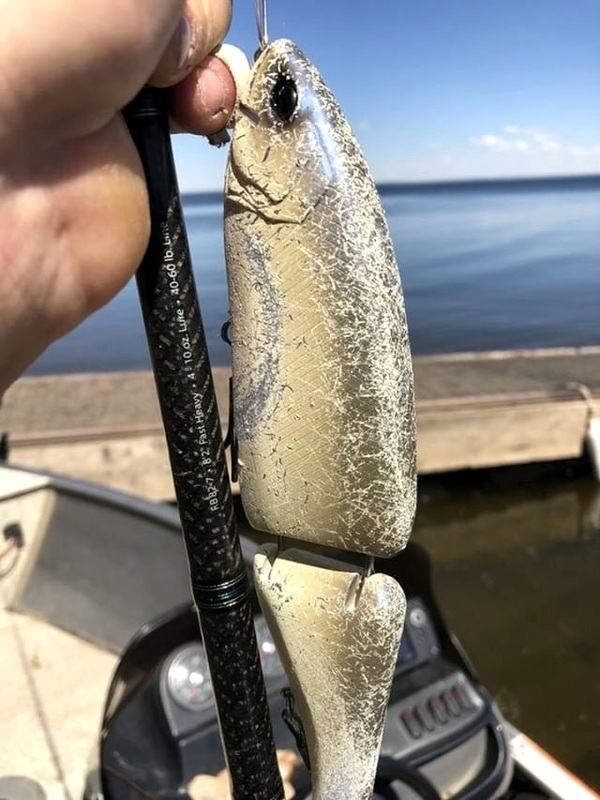 Large baits I’m sure helped with getting bigger bites, but I believe it was the slow glide action that made such a difference that early in the season. how a professional mountain biker become a swimbaiter? Swimbaiting is definitely on the extreme side of fishing. You have specialized equipment just to cast the large baits and of course your dealing with big fish. It takes a die hard and committed angler to get into swimbaiting. Slopestyle mountain biking is no different. You have specialized equipment and its not the type of riding for the faint of heart. Both Slopestyle and Swimbaiting have a core following and community. There is a culture amongst the swimbait anglers just like Slopestyle Mountain Biking. I grew up in a fish or die environment, I was motivated to get out on the water and chase my dreams. If I have the time, I’m going fishing, regardless of the conditions or time of year (of course safely!) A lot of anglers share this same passion and lifestyle. This sparked Fish or Die, a brand for die hard anglers. My vision is to promote fishing and create products for this community. I have created an Instagram account @_fishordie, I have stickers available and apparel is in the works. That’s a great question, where I see myself in 5 years. I am so happy I pursued mountain biking and took the risk to be a professional athlete. Staying relevant in the biking industry with new young new riders isn’t easy. I’m taking time during this transition to look at my options and explore my passions. Fishing is absolutely one of my passions and is high on my list of priorities when looking at my future as well as career options.